A number of other schools have also been forced to implement their emergency security policies after receiving threats or have been involved in a high-profile incident. These have included fears of intruders and bombs threats, or pupils bring weapons into schools. Read more>>> Leyland school bomb threat: What is a school lockdown and what can parents do? Here are some of the incidents which have sparked fears among parents. The primary school was put in ‘lockdown’ after an incident by its gates in November last year. St Annes Catholic Primary, Slater Lane, Leyland, says it was not a major incident and that none of the children were in any danger. Some parents had claimed an intruder was chased with police dogs and tasered. But head teacher Liz Darnell said nothing of the kind happened at the school and described it as “a minor police incident”. The school initiated its lockdown procedure last February after the knife claims - which were later found to be a false alarm. Two teenagers who were not pupils at the school had gone to meet a pupil but were not found to have knives. It was a traumatic event for children and teachers at the school as they were told to lock themselves into classrooms, barricade the doors and hide underneath desks. Pupils were kept inside the school for over an hour, and when shaken children made their way out of the building, many were in tears. The school confirmed that pupils and staff knew exactly what to do as they had practiced lockdown the term before. A Lancashire mum whose son was pinned to the ground by another pupil brandishing a knife says she believes many prefer to bury their heads and brush over issues. Sacheen Leigh, who lives in Clayton-le-Woods near Chorley, was horrified when her son Ethan, who was nine at the time, came home from primary school to tell her he’d had a knife held to his neck by another boy. Sacheen, who is a healthcare assistant and student nurse, ended up removing her son from the school after the incident last summer. Sacheen, who is married to Damian and has seven children of whom Ethan is the youngest, says: “I went to collect Ethan from school and the headteacher came over and told me that there had been an incident at lunchtime and it was nothing to worry about as it had been dealt with." Karen Marshall, headteacher at Manor Road Primary School, said: “An incident took place last year at school which was dealt with quickly and safely and reported to the police. “I spoke to the parent on the same afternoon that this took place to make her aware of what had happened and the incident itself. There were 18 permanent exclusions and 58 fixed period exclusions due to weapons in Lancashire schools during the 2016/17 academic year. 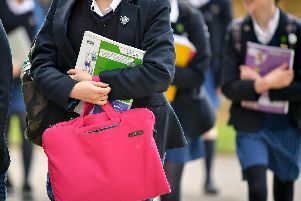 Figures disclosed by Lancashire County Council show during 2016/17, there were six permanent exclusions in Lancashire schools due to weapons - four were due to knives, one a pen-knife and one a BB gun. The reasons given for the 24 fixed exclusions - where pupils are temporarily removed from school - six involved a dangerous weapon or object, four unknown or prohibited items, four a BB gun, one a catapult, two for laser pens, four for knives and three for pen knives. During the previous year, 2015/16, there were 12 permanent exclusions at Lancashire schools involving weapons and 34 fixed period exclusions.